Join us October 9th for the Board of Education Meeting. Public session begins at 7 p.m. in the board room at the district office, 92 Lodestone Way, Tooele. Tooele County School District is pleased to announce 7th through 12th grade students now have access to an Office 365 account and a district email address. The accounts were activated Thursday, Aug. 30, 2018, after a lot of hard work between Microsoft and the TCSD Information Technology Department. Summer has ended and school has begun. It’s time to get back into the swing of a nightly routine. Andy Carlsen, Clarke N. Johnsen Junior High principal offers tips and encourages parents to reach out to teachers. Welcome New Directors and Administrators to TCSD! When it comes to leadership roles this school year, Tooele County School District will welcome five new employees to the district, while strategically moving 12 current employees to new roles. GJHS is taking nominations for those wanting to serve on our Community Council! Elections will be at the Back to School Night, Monday the 20th. This is an incredible opportunity to assist the school. Please contact GJHS for more information. We are planning three school open houses. 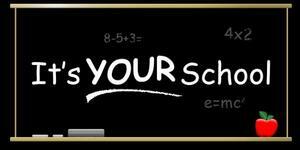 *7th grade students: Wednesday, August 15th 10 a.m. to 5 p.m.
*8th grade students: Thursday, August 16th 10 a.m. to 5 p.m.
BACK-TO-SCHOOL night is Monday, August 20th 4 to 6 p.m. for all parents and students and our first School Community Council Meeting will be August 20th 6 to 7 p.m. For more information please call the school at 435-884-4510. 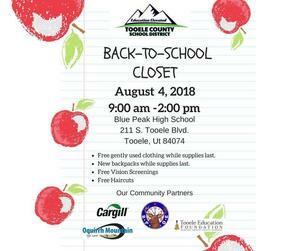 Tooele County School District and partners will be hosting the 15th annual Back-to-School Closet August 4th from 9 a.m. to 2 p.m. at Blue Peak High School/Tooele Community Learning Center, (211 S. Tooele Blvd., Tooele, UT 84074). TCSD students and families are invited to attend. Earlier this month a $250,000 state grant was approved for hiring five additional elementary school counselors in the Tooele County School District. The new hires will begin in August just in time for the 2018-19 school year.